I wanted to take a few moments to reflect about my experience at the 6th annual North American Conference on Video Game Music, which I’m flying back from right now. NACVGM 6 was held at the University of Hartford, Hartt School, in their beautiful Millard Auditorium. One of my main takeaways after seeing four NACVGMs (1, 4, 5, and 6) now is how the quality of presentations has grown. To me that showcases the importance of a conference like this: by seeing and hearing other scholars’ work, there is a general elevation of the research and knowledge. The conference has also grown physically as well. I’d guess that keynotes at the first NACVGM had about 70 in attendance and that keynotes in the last two broke 100 attendees. Some of my favorite papers included the very first one, by Elizabeth Medina-Gray, analyzing the talking sound from the first Dragon Warrior/Quest. Really interesting to consider this short sound that I’d only thought of as noise in relation to the key of the game, and as a musical entity. I’ve often asked my students what the sound in the first Legend of Zelda is meant to represent— typing? talking?— so this was right up my alley. Elizabeth's presentation really set a standard for the conference. 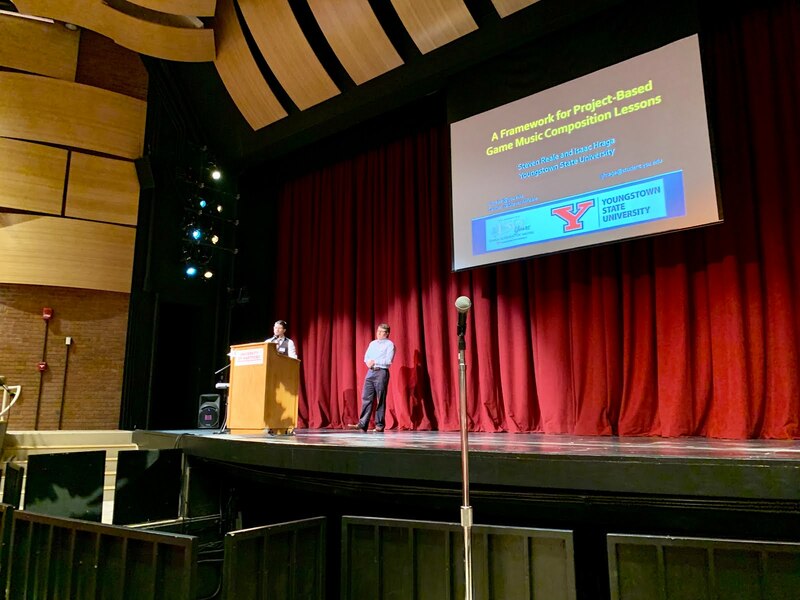 Two other highlights for me were Steven Reale and Isaac Hraga’s joint presentation about their work over the last year having composition and implementation lessons at Youngstown State. Very inspiring and I’m hoping to implement some aspects of that work at U-M in the coming year. Also, William Ayers had a paper that I found very fascinating about echolocation in video games. While he started talking about games where players play as dolphins, most interesting to me was when he turned to the matter of horror games where the player’s in-game sight is restricted. I show Lurking often in Video Game Music class if the students want to do horror games and I love how this sort of game design ties in the importance of sound to the gameplay mechanics. Really awesome. Of course the Wilbert Roget II’s keynote address was really amazing. He presented on a history of using middleware in his game experience. I loved this because the technology is relatively new, has changed a lot through time, and also no one has really focused on that before in a talk that I’ve heard. Instead, usually the compositional process is the focus or how that process has changed through time more than the implementation aspect. This NACVGM was definitely memorable in another way: a lockdown on campus during lunch on the second day, related with a stabbing incident in the dorms. Sadly, many of us are familiar with lockdowns from instances at our own institutions, so we were able to handle it fairly gracefully. The lockdown lasted a couple of hours, and after a bit of frantic texting and communication, Elizabeth Medina-Gray and I were still in the auditorium— we never left for lunch— and as members of the conference committee, were able to restart the conference a bit late and catch up by the end of the day, still ending on time. Ryan Thompson was a huge help too, coordinating many matters and even allowing the other members of the NACVGM committee to watch over Skype. One issue that presenters worried about was the topic of the afternoon presentations, which had to do with first person shooters and other violence and horror in games. However, we persevered and gave appropriate content warnings ahead of these presentations. The lockdown was soon lifted and folks were able to return to campus, get their luggage and belongings, and rejoin us in person. While luckily none of the NACVGM participants or attendees were hurt, our thoughts went out to the students who were injured in this incident. When I return to GameSoundCon in the fall to co-chair their academic branch with colleague, Dr. Dana Plank, we hope to continue to spread the word about NACVGM there and drum up more interest. It’s clear that the conference’s future is looking strong. Next year, NACVGM 7 will be held at Ithaca, hosted by Elizabeth Medina-Gray. Hope you might attend! I find NACVGM to be inspiring and motivating, making me want to move toward some publication goals I have upcoming. Beyond that, it’s simply fun to dork out with a community that loves video games and game audio. Let me know if you have any questions about NACVGM. NACVGM 5 was live streamed and many portions of it are hosted on YouTube. A few of the virtual talks from NACVGM 6 are available as well, and were excellent: both Kaitlin Saari’s video on Breath of the Wild (she really set a new standard for these!) and Ryan Thompson's video’s on Esports were stand outs that you might be interested in checking out. I've just finished up an exciting week at U-M that involved Dr. Martin Leung's visit to U-M. He completed many different activities while here: teaching lessons to my studio, speaking to the piano majors, being a guest in my Video Game Music class, making a Vodcast that will come out later in the year, speaking to students at large about incorporating the internet and video game music into their portfolios, and playing a concert as well. Dr. Leung's visit was a major event in my year of research about this kind of music. I was really glad to see how much enthusiasm some of the piano majors had regarding this material. Even the faculty seemed pretty supportive of it as well. Most of all, I was just glad to make an School that in many ways is slow to update repertoire outside of the traditional canons and acknowledge career paths beyond the traditional "super star performer" face up to someone who has had success in another way. Although it definitely made a difference in the present culture, I think and hope it has the ability to make a difference down the road— that students and scholars who come after will be able to look back and say: "hey, this guy X years ago had a piano studio that played all video game music, so why can't I do Y?" I'm sure some of my colleagues think I don't belong in this space, doing this research or teaching, and/or that the repertoire is not worthy of attention and focus. But I'm really learning this year just how much of a community this music creates. One of my favorite take away's from the week was when one of my students greeted Martin at the start of his lesson by explaining that finding Martin's YouTube channel over a decade ago also led him to a community of music lovers who were passionate about video games and video game music. One of the things I've learned in all my years of work in game audio is that gamers have a "coming out" process— many people play games, but they don't talk about it often. However, because of my work, people DO talk to me about their interest in gaming and what they're playing. I'm always glad when anyone can express him/here self more, and it was an emotional experience to see one of my students explain that he'd found inspiration from Martin and his playing video game music for years. Wow! Lastly, I'll leave with a comment about the recital Martin played. (If you're interested in any of his arrangements, you can find them for free for a limited time on the sheet music portion of his website.) As you can see from the above picture, the recital was well attended by all sorts of students and even guests who had driven a long way to get to Ann Arbor to hear him. I really enjoyed the event and was delighted to play some duets with Martin at the end of the program. Turns out these are the first video game music duets that he's ever performed! I put these duets up on my videogamemusicnerd YouTube channel, but I'll share my favorite of these duets here. I absolutely loved playing Super Mario Galaxy, and also the reference to Super Mario Bros 3, in the middle of this duet. Despite the fact that we probably had only about 45 minutes to rehearse, these duets really came together. In fact, one of my students wrote a reaction to the recital, commenting: "The duets were incredible— really in sync— you seem to play off each other well." I think that playing piano duets is one of the hardest things to really have exactly together because of the percussive nature of the instrument, but we did it! Overall, a tremendously busy week, but also an important one in my research that I'm still digesting. 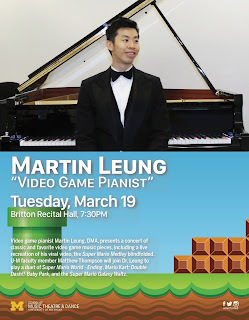 Have you heard Martin play video game music? Did he inspire you and help you find a sense of community? I'd love to hear about it, if so. I thought it'd be fun to give a little view of some research that I'm currently working on. Just about a year ago, when I hosted the North American Conference on Video Game Music (NACVGM) at the University of Michigan, I made a presentation about video game piano transcriptions. I titled the talk "There's no question you'll be popular after performing these in front of your friends: the pedagogy and performance of piano transcriptions of video game music." The title is a line from the beginning of a Zelda collection and I thought that was perfect. In this presentation, I discuss the variety of piano material and how the game audio is adapted to work well in a linear format for live performances. In doing this presentation, I also became the first person to perform on a traditional instrument live at NACVGM, though others before me had made music on game systems. As I say at the end of the talk, I was planning to have a studio of pianists to have lessons and study video game piano music with me in the coming year. That's this academic year, and I'm in the midst of that research. Although it's a lot of extra work to have five piano students and a studio class on top of my normal teaching schedule, I've learned a lot and am hoping in upcoming years to publish about my experience, my students' experience, and about the repertoire. My hope is that if more teachers of piano knew about this material, they would incorporate it into their teaching. One outcome that's already clear to me is that this sort of material will attract students who would not otherwise be interested in studying piano. The year is going so well. I have a variety of students to help explore the repertoire from a beginner who had never had piano lessons before (though he could read music as a violinist) to a student who could easily have been a piano major if he'd desired it to a doctoral student who helps me with researching the pedagogy of these collections and other aspects like how to program a piano recital of all video game music. My studio had our first concert at the University of Michigan Museum of Art a few weeks ago as a midway project and Peter Smith took some great pictures from the event, including this one of the studio just after we finished. As far as I know, this is the first collegiate studio of pianists working on video game music. Pretty cool! Although only one of them, the DMA student, is planning to go into the profession, I'm delighted to have inspired the others to revisit their piano playing and hope they'll stay with it through life. There are some other upcoming events that are exciting too. 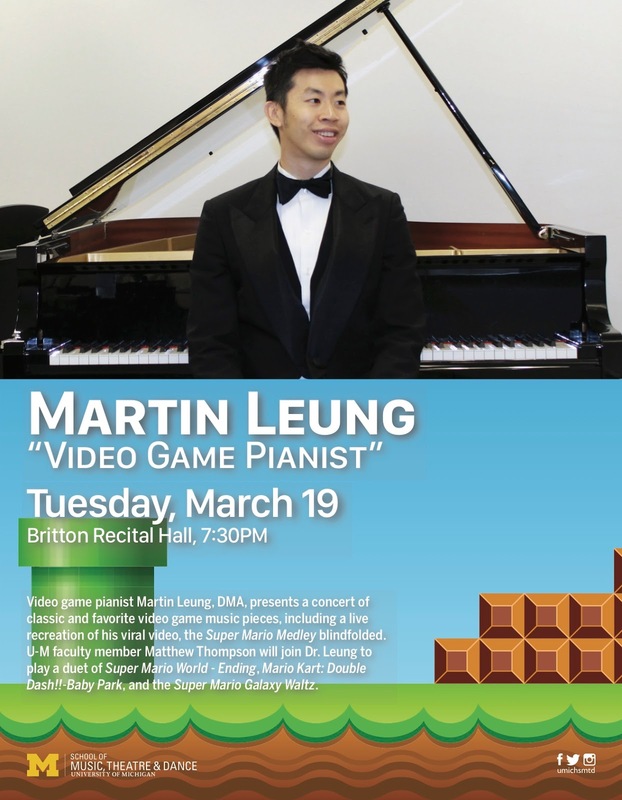 Video Game Pianist, Dr. Martin Leung, will be coming in about 10 days to give lessons to my students, and speak to the piano majors at U-M as well as other students about his career and how the internet has changed the modern musician's career. He's also playing a concert and I'll be joining him for a few duets he's arranged-- they're hard! This concert is free and open to the public if you're in the Michigan area. We have an end of semester recital planned as well, April 13th. So it's a busy few months. Meanwhile, my students are keeping journals about their practice and work and have formal interviews that I'll be able to study through as I'm working on publications I hope will come out of this year. Since I started this project, I learned of another pianist who is doing research in this area, from Tarleton State University, Dr. Leslie Spotz. She gave a recital after a sabbatical researching video game piano transcriptions the day after my studio recital at the UMMA. So cool to realize you're not alone in interests and what you're researching! That said, I bet there are more folks out there in a similar case. Do you use video game music in your studio teaching? I'd love to hear about it if so, and especially if you're a pianist. What works well? What doesn't? How long have you done it? I welcome any comments or chance to connect about this. I'm excited and delighted to have my second guest post of my blog's history, again by my student Andrew Lipian. He's been working on this one for quite a while. Again, I think it's great to hear about these current experiences for students who have attended them. Here he describes his experience during the past summer in the Video Game Scoring Workshop at NYU Steinhardt. Before the snow melts, flowers bloom, and the school busses whir to a stop, up-and-coming game composers will be thinking of how to enhance their audio chops this summer. They need look no further than the Video Game Scoring Workshop at NYU Steinhardt, led by game composer Tom Salta and his team of fellow audio pros. These included Gina Zdanowicz - founder of Serial Lab Sound - who lead students through the technical side of creating adaptive music systems in Wwise, and Jason Kanter - Audio Lead for Avalanche Studios in New York City - who gave a presentation on sound design and joined in discussions regarding the business of game music. Bolstered by such a well-rounded team, this program was unique from others. Composers usually sign up for similar workshops to master the machinations of Wwise or FMOD –audio implementation tools – but this program takes it a step further. As part of NYU’s “Screen Scoring Summer Workshop” offerings, students travel from global destinations such as Japan and Israel to attend a week-long intensive workshop offering one-on-one training in Wwise by NYU faculty and staff. During the week, however, the entire group actively observes each new iteration of their individual interactive audio projects which get critiqued and modified by Salta over the course of the week. I had occasion to audit the 2018 class, watching the students’ creative processes unfold until they caught lightning in a bottle, leaving with a fully functional and implemented game score. Notably, what Salta had championed with this program was unprecedented for NYU. The students downloaded “Angry Bots,” the game they would implement their music into with Wwise. Angry Bots is a third person shooter with a solid-snake-like character, thanks to the creative voice overs scripted and recorded by fellow instructor, Gina Zdanowicz, infiltrating a Robot Laboratory as the lethal machines attempt to terminate him. Each code he cracks opens a new door, creating opportunities for the score to develop as he delves deeper into the labyrinthine facility. After also downloading Wwise, the students are then asked to begin sketching music for the game using their Digital Audio Workstations (DAWs). The entire class witnessed their peers develop and conceive music in a linear fashion – structured with an A and B section with a loop, for example – into horizontal resequencing, where specific in-game actions “trigger” the next music track. For Salta, watching the students master this concept was a highlight of the course. The students – ranging from High-School to seasoned professionals – created scores as diverse as the nations they hailed from. One memorable moment occurred when a composer’s use of a trailer rise (consisting of several string instruments rising to crescendo with tremolos) surprisingly fit the action every time it appeared. Another came when a student from Japan envisioned a lighthearted, comedic element to the level – opting for a jazzy track smacking of something from “The Naked Gun.” Every one of these ideas changed the feel – even the identity – of the game; a reminder of the important influence music has in shaping the playing experience. None of this would have been possible without the see-what-sticks approach of Salta and his team, who created a learning environment which encouraged inventiveness as much as it spurred technical mastery. All this was part of the plan. Most assuredly, it was this atmosphere that lent so many international students their most formative experience in game scoring to that point – and that same atmosphere will continue drawing throngs of ambitious composers to NYU, ready to harness the powers of this interactive medium in immersing the next generation of gamers. These skills, Salta adds, are a must-have for those aspiring to a career in game audio. As the industry changes, the skills one is “expected,” to have, versus those which are “desirable,” shift. These days, if you want to work in video game music, you are expected to know Wwise or FMOD and understand audio implementation, a skillset this course specializes in teaching. 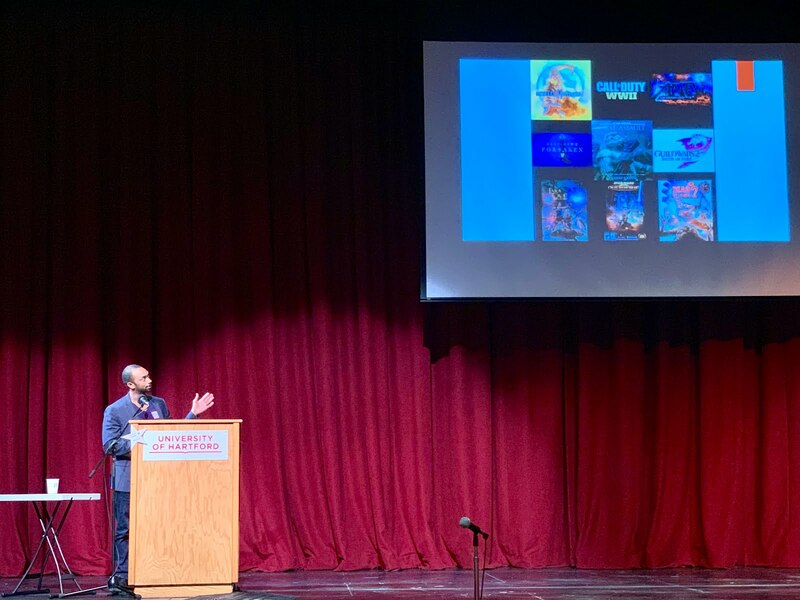 When today’s composers are ready to take their skills to that next level, Tom Salta and the NYU “Scoring for Videogames” Workshop are there to give them the tools they need to succeed. *Program dates for the 2019 NYU Scoring for Videogames Workshop are June 30 – July 5. I'm delighted to have my first guest post on my blog! The below is written by my first ever one-on-one game audio student, Andrew Lipian. Andrew won a student scholarship from the Game Audio Network Guild to attend GDC in March and I ask him to document his experience. I thought it'd be cool to hear about the conference from the viewpoint an attendee who is both very interested in the field, a young up-comer in the area, and who went to GDC on scholarship. Also, a great chance for him to synthesize all the notes he took there and his overall experience. Andrew will have a second post upcoming soon as well where he describes his recent experience at NYU Steinhardt's Video Game Scoring Workshop. 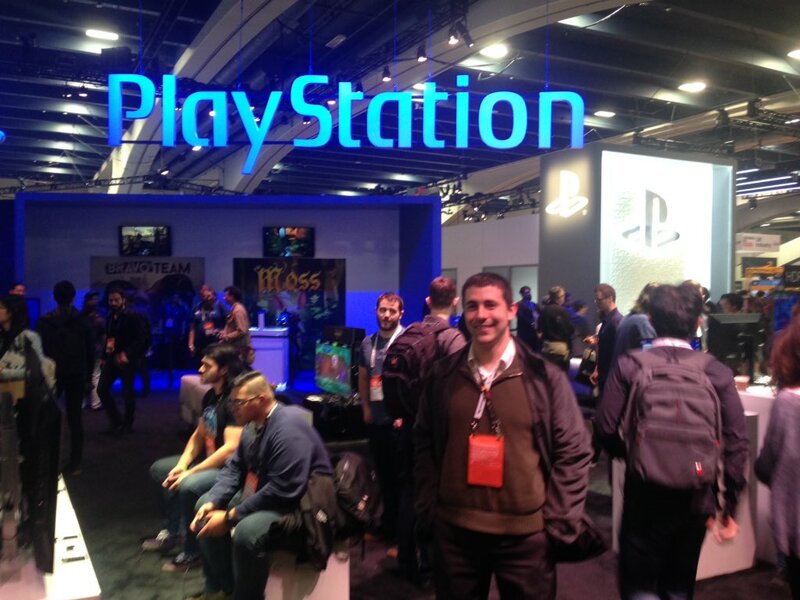 Four months have passed since the Game Developers Conference (GDC) in San Fransisco, where droves of video game industry elites gather annually to discuss the mechanics and business of gaming. I recall a large, imposing map of the world in one of the conference halls with the words “where are you from,” scribed above it. The map was bathed in little red dots indicating where attendees hailed from; not even Siberia was without a few. As I squinted between the chicken pox markers to find my home in Ohio, I began to reflect on the awesome conditions that brought me to this remarkable conference; how, exactly, did I get here? Why, studying video game music with Matthew Thompson, of course! His guidance helped make my secret passion for game audio a not-so-secret passion by having me apply for a longshot scholarship to the Game Audio Network Guild. This award included an All Access pass to GDC with a personal industry mentor in game audio. I submitted a 1-minute RPG-style battle track I wrote under Thompson's supervision, a narrative with some letters of recommendation, and I was elated to see I was selected for the award! The University of Michigan School of Music Theater and Dance (SMTD) even paid for my flight! What would follow? A whirlwind of corporate convention constructs the size of circus tents, endless panels and seminars on all aspects of game development; industry titans roaming about like average Joes, and a bevy of indie video game stations ready for play. The Moscone Center, host of GDC, was a veritable sea of people. The complex is broken into three massive buildings (North, East, and West), the former two with sprawling convention expos in each basement (if you can call something the size of a NASA Space Silo a basement). Throngs of video game journalists, voice actors, narrative writers, graphics artists, directors, CEOs, programmers, and game designers painted the halls and courtyards. While I enjoyed these diverse people and their ideas, what I was really there for was the Game Audio. I would soon be greeted by my assigned mentor, Adam Gubman. CEO and founder of Moonwalk Audio, who has written music for hundreds of clients such as Disney, Zynga, Storm8, Sony, PlayFirst, GSN, GameHouse, NBC Today, and Warner-Chappell – to name a few. 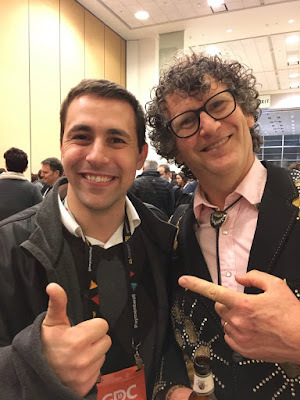 We met at one of the many meet-and-greet tables on the third floor of Moscone West, where I would get acquainted with one of the most motivated people I have ever met. With a forward, engaged posture and a surveying glance, Gubman was a dodecahedra-tattooed, spikey haired mensch; intense and cool, with a quick wit and boundless passion for music. He also had a no-nonsense approach to success: if you want this, work hard every day, don't burn bridges, absorb all you can, and persist. I've seen men of his intensity in successful musicians like Tommy Tallarico and Tom Salta and have come to identify it as the flagship trait that makes these men so successful. Their time is precious, they waste precious little of it, and tackle every task with speed and abandon. Adam would prove an impactful mentor, spending a great deal of time with me despite a very busy schedule of his own. Explaining a personal story of how a demo song of his won a Golden Globe, Gubman said you never know what each opportunity could bring. Demonstrating loyalty and compassion, he tells me, creates a “halo effect,” building rapport and camaraderie with potential clients. 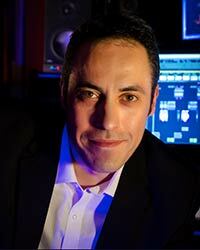 Trust and Loyalty, Adam believes, set you apart from other composers and earn you respect. He advised I take on GDC as a sponge, absorbing all I could, and give my time to every opportunity, even if the upshot for involvement wasn’t clear yet; I decided to run with his advice. There was no shortage of sessions to enjoy in game audio. From a seminar in VR audio, featuring Winnifred Phillips as lecturer, we analyzed how special positioning for music can be more immersive than stereo in this medium, using 3D elements to implement a 2D score into the VR world. Music could even transition from 2D to 3D for dramatic effect, citing how she used 3D sound effects in the game “fail factory,” to accent the 2D musical score, creating several sounds in the “VR space.” One example was the loud “clang,” of a factory mallet dropping as the downbeat to a soundtrack for a stage. Analyzing “Shadows of Mordor,” with Nathan Grigg and Garry Schyman, they discussed how the tribal identity of various tribes in the game informed the musical themes. Using a tribe’s unique armor types, appearance and function of forts, enabled them to use the music to accent these properties. For example, the “Machine Tribe Fort Theme,” is comprised of billowing smokestacks, so he created a “non-melodic, plodding rhythmic theme with odd sets of industrial sounds to blend together and bring the orchestra in, underneath. Also, in a post-mortem on the “Call of Duty WWII,” sound track, Will Roget –who took home almost every award at the 2018 G.A.N.G. awards – described his embrace of a “modern,” sound through expanding on tradition and not limiting oneself to “genre expectation.” For example, to create the “WW II vibe,” he decided upon string quartet and solo cello over big drums and high winds or overt brass. This enabled him to focus on a modern presentation, with an early focus on the “in-game mix,” such as using trumpets only for doubling horns (instrumental EQ), and expanded low winds and brass into a “synth tuba.” He peppered his music with signature sounds, like the “echo horns,” in the piece “Memory of War,” or air raid sounds in the piece, “Haze of War.” Roget even used extended playing techniques, such as aleatoric orchestral techniques and “overpressure” in the strings. There was so much to absorb, I haven’t space in this post to include it all! GDC was an unforgettable experience, where endless paths crisscross into an intricate network to produce the pixelated art and sonic beauty keeping our hands glued to a controller. Whether I was examining the music of “Middle Earth: Shadow of War,” having my music played and critiqued before a panel of game composers at the “Demo Derby,” (where it was well received), or making new friends and colleagues, GDC provided an invaluable foot in the door for what I love to do. 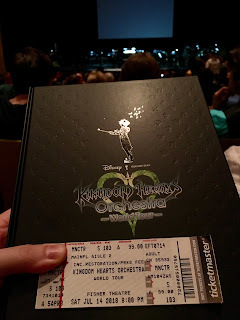 Saturday July 14, 2018, Vince and I attended the Kingdom Hearts Orchestra World Tour at the Fisher Theater in Detroit. As I have historically done when attending game music performances, I wanted to write a review of the concert while the event is still fresh in my mind. And while I’m tougher on these events than most fans, I’m also more fair than the reviewers who immediately disdain these performances because they aren’t Beethoven. Before I go further, here’s my usual caveat that I’m not the normal concert goer for this kind of event. The audience for these events seems to average even younger in age than I am, and many seem to be inexperienced with attending a concert with classical origins like this. I’m a professor of music with a doctorate in performance. This was the third game music concert I’ve attended, and if you’re interested, you can read my other reviews of A New World: Intimate Music from Final Fantasy and Symphony of the Goddess, both of which I’ve attended in the last couple of years in Southeast Michigan. This KH Orchestra shared many of the same features as the other game music performances I’ve seen: a young and enthusiastic audience that many classical or jazz concerts would kill for (an usher told us the concert was 80% presold), attendees in costumes— though notably few compared to the other game music concerts I’ve seen— with elaborate hairstyles, tee shirts, and game memorabilia in hand, particularly keyblades. Drinks and snacks were allowed into the venue; I saw numerous beers in adult sippy cups as we watched the performance. And, of course, there was the largest, snaking line ever to get to merchandise, "merch" to this crowd, before the show, at intermission, and after. In fact, the show start was held for at least 10 minutes, no doubt to allow as many patrons as possible to make their purchases. One difference between this and the other game music concerts I’ve seen stood out immediately: the orchestra was not onstage warming up. Instead, they walked out at 8:10, tuned, and began the concert promptly. The pianist walked out with the conductor for a solo bow, similar to how Benyamin Nuss was featured at A New World, though the piano never played a solo number at this event. But Simomura’s writing often features piano and oboe, so I was glad to see the pianist receive recognition. I did think the pianist was quite expressive and one of the best players in the orchestra. (As a side note, considering how much piano is featured in this music, the piano could’ve been tuned much better, especially in the upper register.) Both the pianist and conductor put their earpieces in to hear the click track and the concert began. There were also some differences in this game music concert and the others I’ve been to. The most notable was that there was no speaking from stage, no MC to address the audience. An audience member beside us said she’d seen the concert in New York last year and that Yoko Shimomura came on stage and thanked people for attending and supporting her music. I didn’t expect that to happen in Detroit, but hoped for some spoken interaction from someone involved in the project, even a video message as Koji Kondo had in Symphony of the Goddess. While I did appreciate the focus solely on the music, as Vince said when we were leaving, this made the event feel “cold.” It feels unusual to me for a concert these days to have no speaking to the audience, and I, too, felt the disconnect Vince referenced. Aside from two cutscenes with Japanese dialogue and English subtitles, there was no speaking at this event. There were no lighting changes and the projection was always of scenes from the game, rather than ever focusing a live camera on the orchestra members and highlighting them on the big screen. The micing was also very subtle and I never noticed that there were any sound effects from the game used. Another difference is that unlike the Video Games Live or Symphony of the Goddess model, where the creative team travels and “rents” a local orchestra to play the event, the Kingdom Hearts Orchestra is a touring group of musicians that travels playing together regularly. I thought this would lead to a better rehearsed sound and more passionate playing, but that wasn’t the case, at least not tonight. The brass was especially weak, missing notes often in the battle themes where they should’ve been the most climatic. The choir was also very out of tune, particularly in Fate of the Unknown, and the micing of the choir was very off at the beginning of the concert, giving an unsuspecting tenor a near solo. While the conductor was commanding in his physical presence, the tempi in medleys took a while to settle from section to section, and the balance issues— drums often too loud throughout, cellos too soft at times when they had the melody— were never addressed. Of course, there’s a mixing team working live in the event, so the players onstage may be unaware of the sound in the auditorium; in this case those amplifying the sound should know better what to raise and lower. Aside from crouching down for some soft moments, since there was no addressing the audience, and only bows at the end of the first and second acts, Vince wondered why the concert had a conductor at all instead of just a click track; in essence, he was a metronome. The arrangements were either short themes or extended medleys; the former felt too abrupt and the latter dragged on at times. We were told by audience members beside us that the Traverse Town selection was a new addition to the concert from what they’d seen last year in New York. I knew as well to expect music from Kingdom Hearts III, and was incredibly disappointed that the footage was just edited down from the same D23 clip released a year ago. My understanding was that one of the unique things about the Kingdom Hearts concert versus the Distant Worlds or Video Games Live! concerts is that there would be new music premiered from the upcoming game. How disappointing then to see the same scene I’d already watched several times on social media promos in a shortened version for this “premiere” clip! 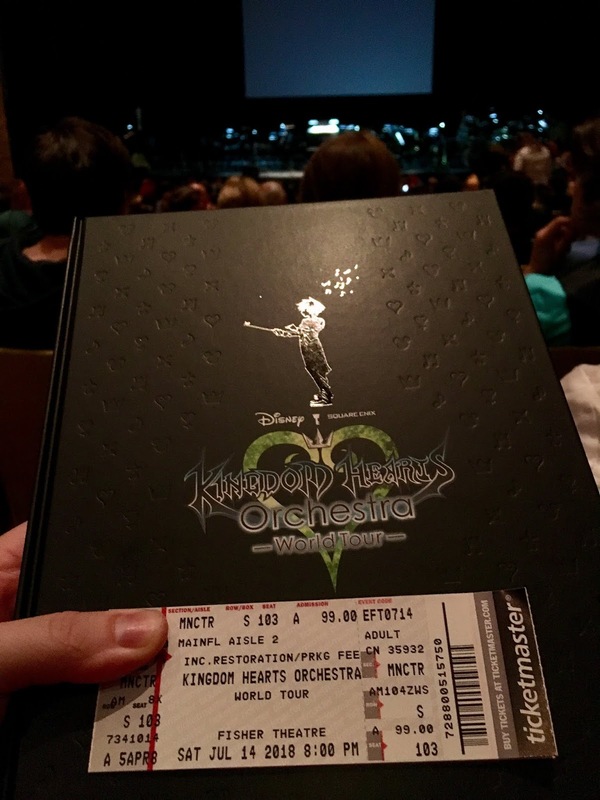 Overall, Vince and I enjoyed the Kingdom Hearts Orchestra World Tour the least of the game concerts we’ve attended. I can partially chalk this up from his viewpoint to his unfamiliarity with the music; KH is a series I’ve played extensively and he’s only watched part of my playthroughs. But honestly, the lack of dialogue with the audience was a big part of our feeling this way too. Also many of the arrangements felt simplistic and didn’t seem to have the same emotional range that the Symphony of the Goddess concert did. That said, most people don’t have the viewpoint I’m coming from and aren’t listening and expecting the same sound my critical ear is. And bringing in a new audience to an event like this is great outreach, even if only a small portion attend another concert. If you follow any internet comments about this event, the fans loved this evening. So my bottom line is as usual: if you’re a fan of the series and its music, check out the Kingdom Hearts Orchestra when it comes to a place near you.